What are the misspellings for york? 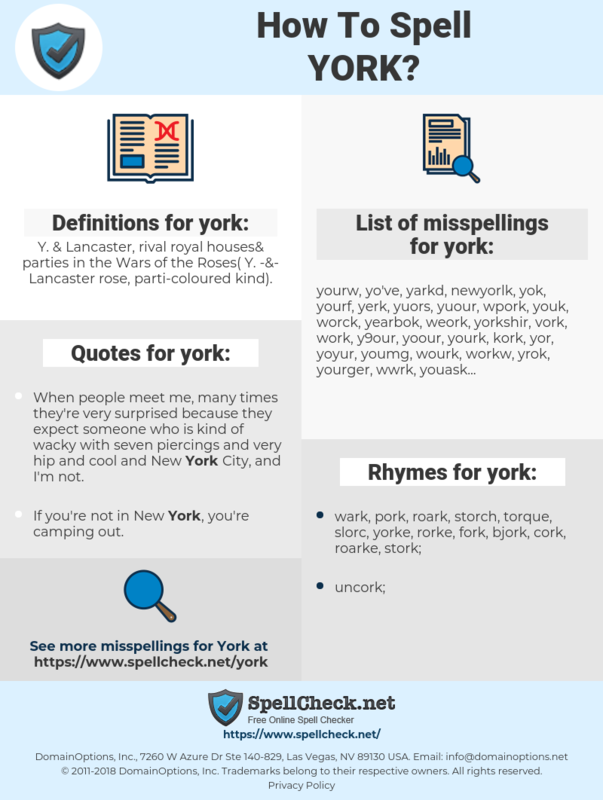 What are the common mistypes for york? What is the definition of york? What are the quotes for york? What are the rhymes for york? What are the translations for york? 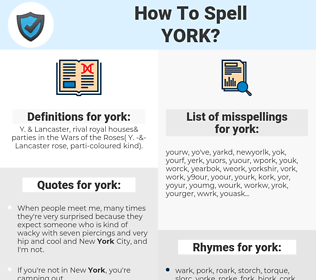 What are the common typos for york? Y. & Lancaster, rival royal houses& parties in the Wars of the Roses (Y.-&-Lancaster rose, parti-coloured kind). York as a boy's name is pronounced york. It is of Old English origin, and the meaning of York is "boar settlement; yew settlement". Place name and surname. Also used as a title (Duke of York) in the English royal family for several hundred years. This graph shows how "york" have occurred between 1800 and 2008 in a corpus of English books.